WeChat is a popular app used by people from all over the world to stay in touch with their loved ones. While WeChat can be a lot of fun to use, it also represents a privacy issue. If you don’t want people to know what you have been chatting about, for example, you may want to delete your chat history. However, just deleting it with WeChat’s own functions is not enough to give you real privacy. Why We Need to Delete WeChat Chat History on iPhone? You might use the app to have private or business conversations which you don’t want anyone else to read. Thus, to maintain your privacy, it is very important to delete WeChat Chat History on your iPhone on a regular basis. Moreover, when you use WeChat to chat with a lot of people, your iPhone gets flooded with the messages, images, and videos very quickly. Over time, all this data can eat up your iPhone storage space and start affecting the performance of your iPhone. Another important reason to delete WeChat chat history on iPhone is for reselling an old iPhone. When you sell your iPhone, you do not want anyone to read your personal conversations, making it very important for you to delete the conversations permanently. While you can delete the conversations right from your iPhone, the deleted data can be recovered easily by data recovery software. However, iMyFone Umate Pro iPhone Data Eraser makes deleted data 100% unrecoverable. 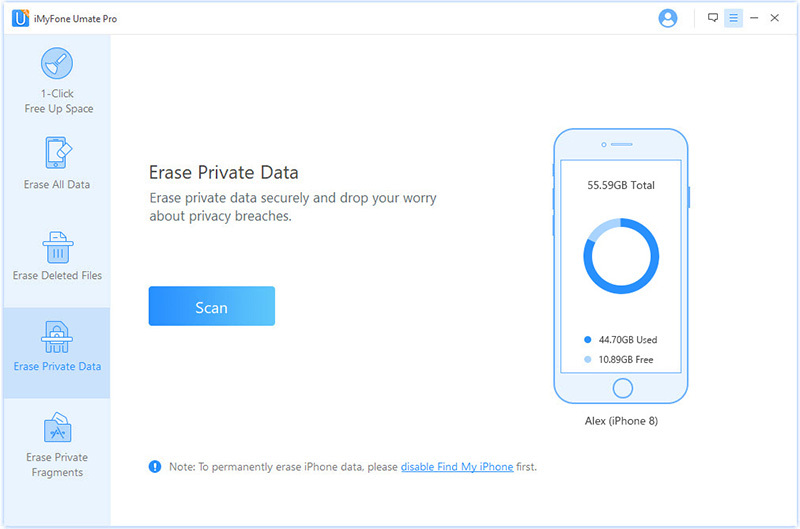 The program can permanently erase your iPhone WeChat chats and attachments. The erased WeChat data is no longer recoverable, no one can retrieve them, even using the most modern data recovery software. 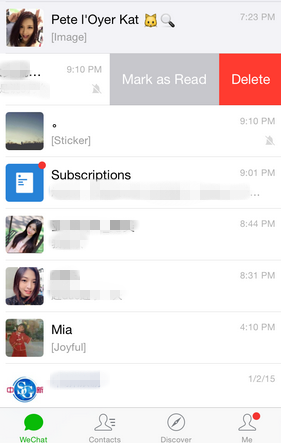 You can preview choose to select some messages in a chat, or select some entire chats to permanently delete from iPhone WeChat. Not only WeChat messages, but also WeChat photos, videos, files, etc. are supported to erase. Manually deleted WeChat chats are recoverable, which can be erased forever by Umate Pro. You can completely delete all the unwanted WeChat chats once at a time, instead of one by one. All the WeChat account signed in on this iPhone will be scanned. You can delete chats from different WeChat accounts at once. Step 1. Once you have downloaded the iMyFone Umate Pro on your computer or laptop, launch it and then connect your iPhone to the computer/laptop. Step 2. Choose Erase Private Data tab on the left side of the interface and a new window will open. Or choose "Erase Deleted Files" to erase previously deleted WeChat chats, or "Erase Private Fragments" to erase incomplete traces left by WeChat, Snapchat, Facebook, etc. Step 3. Click on this Scan button to start scanning your iPhone for private data. When scanning is done, a detailed list of all the private data will be available on the screen. Step 4. Now all you need to do is to select the WeChat chat here and then click on Erase Now button to permanently deleting WeChat Chat history on iPhone. You can have a FREE trial. Umate Pro is free to scan and preview any private data on iPhone. If you want to completely erase them, it will ask you to register it first. While it is highly recommended that you should regularly use iMyFone Umate Pro to permanently erase WeChat Chat history on iPhone, you can also simply delete the chats directly from the WeChat application itself. Follow the steps below to delete your WeChat chat history on iPhone. Open WeChat on your iPhone. You’ll see all the recent conversations. Select a conversation and swipe it to the left. A Delete button will appear. Tap on this Delete button and the conversation will be deleted. Go to "Me > Settings > General > Storage > Clear WeChat". Select the chats you want to delete and hit "Delete" button at the botton. But as mentioned above, the conversations that are deleted with the help of this method can be recovered easily with the help of several tools. Benefits of Deleting WeChat Chat History on iPhone. Let us have a detailed look at the benefits that you receive when you erase WeChat chat history on iPhone using. As mentioned above, overtime the WeChat messages, videos and images can fill the storage of your iPhone and can affect the performance of your phone. The next benefit of one of deleting WeChat chat history on iPhone is to maintain your privacy. When you use the erasing feature of Umate Pro, the messages are gone forever and your privacy stays protected. 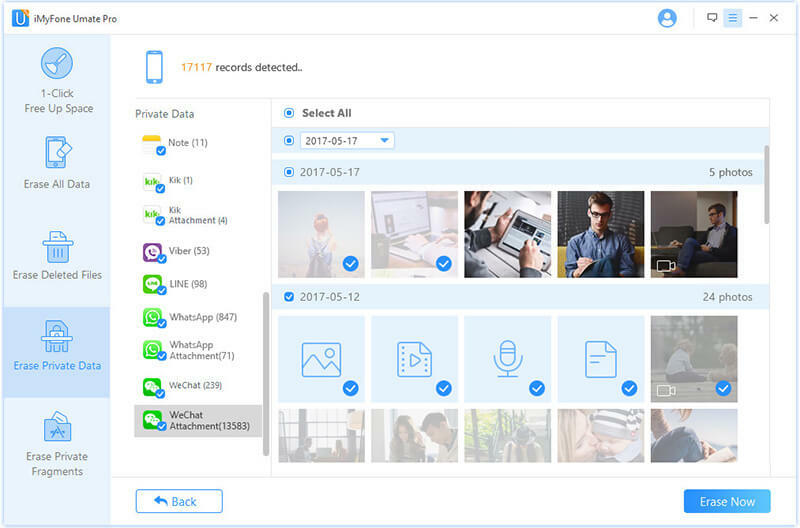 But it is very important to make sure that you don’t have some important files in the chats before erasing them as you’ll not be able to recover them with the help of any tool.